INVEST NI is the government agency that controls millions of pounds to support businesses and create jobs in Northern Ireland. It is the cornerstone of Stormont’s economic strategy, but how is it performing? Detail Data today publishes for the first time three and a half years of financial offers made to Northern Ireland firms, revealing more information than ever on the work of Invest NI. Lindsay Fergus reports. A THIRD of all Invest NI funding to support Northern Ireland businesses in 2011-2014 went to Queen’s University Belfast, Ulster University and the government agency responsible for boosting the film industry, Detail Data can reveal. NI Screen, together with the two universities which also receive millions of pounds annually from the Department for Employment & Learning, were offered a total of £107million from Invest NI. Over the same period the figures show that 2,792 other local firms shared £216million Invest NI funding. The findings emerged from Invest NI data secured by Detail Data through a Freedom of Information (FOI) request. Details of 6,653 offers accepted by indigenous firms between April 2011 - September 2014 can be viewed here or accessed on our interactive map. Invest NI said information on a further £28million of offers could not be disclosed citing FOI exemptions including data protection and commercial sensitivity. Research into the figures provided by Invest NI has also raised questions over the level of job creation, it has illustrated a stark east/west split in Invest NI funding across Northern Ireland, and suggested that Invest NI may fall short of commitments to support deprived communities. Economist John Simpson said: “Invest NI is an important influence on what's happening in the local community. We have had a modest amount of information on the support it has offered up to now. Both universities said that the Invest NI support funded vital research. At Ulster University this included fire testing which helped develop new concrete fire and blast proof panels through its spin-out company Vifkon. And at Queen’s University £7million of the Invest NI funding was spent working with Almac on identifying ways to treat cancer. NI Screen said it did not want to comment on its funding from Invest NI, however, it has used the financial support to attract productions like HBO’s Game of Thrones and Universal Pictures’ Dracula Untold to Northern Ireland. A separate story on how NI Screen, Ulster University and Queen’s University used the Invest NI funding can be accessed here. Three government-funded organisations received one-third of the Invest NI spend on local companies. They were NI Screen (£64million) Ulster University (£24million) and Queen’s University (£19million). Businesses in the east of Northern Ireland received 81% of funding, compared to 19% in the west. A total of 71% of projects that received funding had no specific job creation targets. However, Invest NI said that job creation was only one condition potentially applied to funding, with others including research and development, skills development, or innovation which could also ultimately create jobs. Businesses in the top 10 for Invest NI funding include some of Northern Ireland’s largest profit earning companies - Almac Group, Randox Holdings, Kainos, First Derivatives and Wrightbus. Although such large companies receive funding from Invest NI, the data shows the firms invest considerably more of their own funding to the relevant projects. The companies are also major employers and pay salaries above the Northern Ireland average. 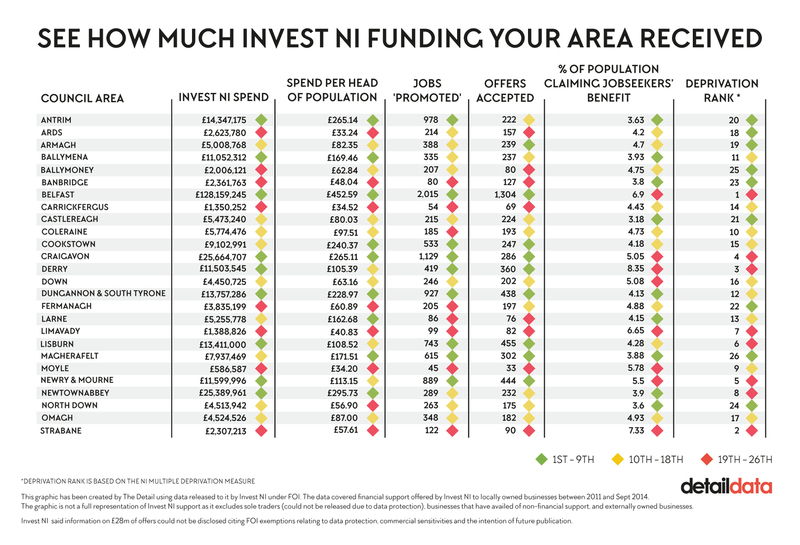 Invest NI’s spend per head of population across Northern Ireland ranged from £33.24 in the former Ards Borough Council area to £452.59 in the former Belfast City Council area. 823 local start up projects were funded. This included initiatives to tackle deprivation with 208 in Neighbourhood Renewal Areas (NRA). Invest NI’s corporate plan target (2011-2015) was to fund 1,500 business start ups by residents of NRAs during the current Assembly term. £257million of Invest NI financial support was spent in urban areas compared to £66million in rural areas. The creative sector secured the most funding (£72million) which went to firms involved in gaming, TV, film and digital content industry, with the bulk going to NI Screen. There are no allegations of wrongdoing against Invest NI, which falls under the remit of the Department of Enterprise, Trade & Investment (DETI), or against any business that received support or any other party. Detail Data cross-referenced the Invest NI data with population, deprivation and unemployment statistics as well as Northern Ireland Statistics and Research Agency classifications for rural and urban areas and neighbourhood renewal areas. The research concentrated on indigenous companies – not foreign owned – as they make up 98% of businesses which are VAT/PAYE registered here and account for 76% of Northern Ireland employees. According to Invest NI in 2014/15 93% of its offers of support were to local companies. Invest NI defended its record in a lengthy response to Detail Data, available here: invest ni responses.docx, and said its targets and reporting structures are set by the Northern Ireland Executive. “Our support has helped local companies grow to scale, reach new customers in new markets, develop new products and create new jobs,” it said. 11,629 new jobs were ‘promoted’ by local companies –almost double the target figure set out in its Corporate Plan (2011-2015). Jobs promoted are jobs that a company intends to create as a result of the project over three to five years. Local firms committed to investing more than £1.1billion in the economy. The most offers were made to micro businesses employing less than nine people. Invest NI client companies provide employment for more than 70,800 people. (Invest NI said the number of employees for 155 companies was “not available”). According to Invest NI’s data, it promoted 11,629 jobs at a cost of £100million – this works out at £8,620 in government support per job. The job creation projects ranged from multi-million pound medical companies like Crumlin-based Randox in Co Antrim, to social enterprises like Me Unlimited in Bellanaleck, Co Fermanagh, which supports carers. Randox received £4.7million in June 2014 to assist in the creation of 540 jobs while Me Unlimited secured £10,304 in December 2011 to assist with the creation of one job. The most successful sectors for jobs – promoting more than half of all jobs – were business services, food and life sciences. Of the 6,653 projects which secured Invest NI financial assistance, 11 intended to create 100 or more jobs and 4,718 none. There has been much debate of Invest NI’s measurement of jobs it has promoted, rather than the number that are actually created. Invest NI said “jobs promoted are new jobs that a company intends to create as a result of the project. They are usually created over a three to five year period, as defined in the company’s business case”. But the Audit Office has previously criticised the jobs promoted measurement; as has the Public Accounts Committee. The Audit Office’s report ‘Invest NI: A Performance Review’ published in March 2012 states that “the most reliable estimate suggests a 75% conversion rate” of “promoted jobs which translate into jobs created”. Invest NI said this now stands at 76%. Using the 76% figure would mean of the 11,629 jobs Invest NI said it promoted between 2011 and 2014, around 8,838 are likely to materialise into jobs created. We examined the business accounts of 417 of the companies funded by Invest NI. The companies were randomly selected by Detail Data to provide a sample for examination. A review of their operation showed that 29 had collapsed, while eight were facing being struck-off and eight were dormant. Invest NI stated: “If a company fails to maintain the number of jobs we have supported, or a company ceases trading during this control period Invest NI will seek to recover monies – this is called ‘clawback’. The Invest NI data showed that businesses based in the west of Northern Ireland benefited from £60million of financial assistance from the economic agency over the three and a half year period covered by our FOI request, with £263million invested in indigenous companies located in the east. Detail Data used the same east/west boundaries as used by the Audit Office when it reviewed Invest NI’s performance. The Rural Community Network (RCN) has also expressed concerns about the level of funding going to rural areas – and infrastructure, particularly broadband connectivity. Our research found £257million Invest NI assistance went to urban areas compared to £66million in rural areas. He called on the Executive to do more to support local companies which he described as the backbone of the economy. He added that there were “infrastructure deficits” which needed addressed through a “credible plan” from the Executive. 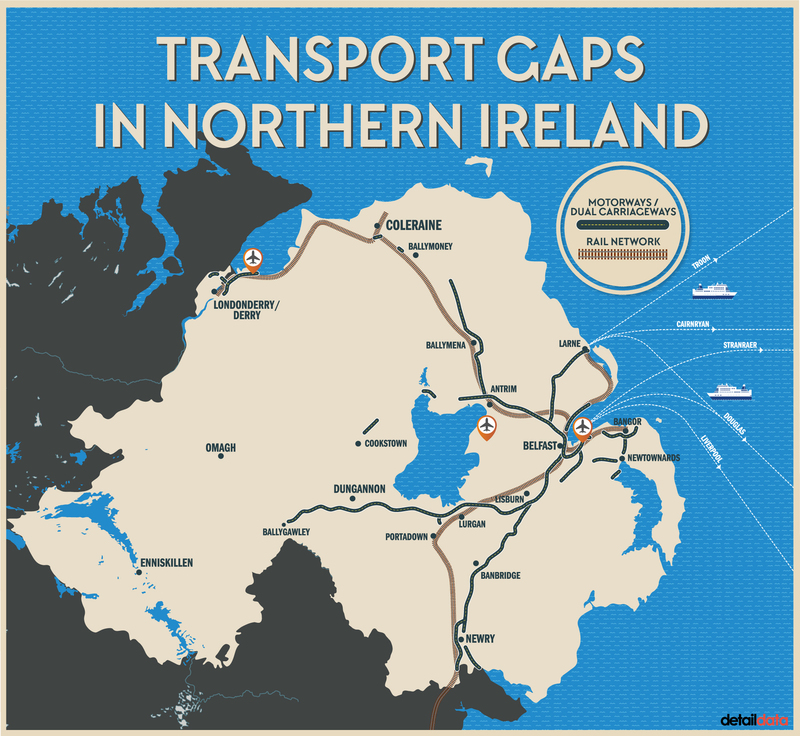 Experts have said that while Invest NI cannot compel companies to locate in particular locations, the geographical disparity raises questions about the need for improved transport and communication networks in areas outside of greater Belfast. Invest NI said that its support for business is “demand-led” and that budgets are not allocated to specific locations. However, Invest NI confirmed that not all of the 68,000 businesses which, includes around 1,600 foreign owned, are eligible for Invest NI support. While Invest NI cited the total number of businesses the data shows that over the three and a half year period it financially supported less than 5,000 local companies. According to the data it financially supported 2,795 companies. Information on another 1,789 companies that received funding could not be disclosed by Invest NI which cited FOI exemptions including data protection. That means Invest NI funded up to 4,584 local companies over three and a half years. DETI’s Research Agenda 2012-2015 states “Invest NI delivers a wide range of support to companies throughout NI, and has a target to ensure that a proportion of investment projects are close to areas of economic disadvantage which have high levels of poverty”. As the period of the FOI request covers April 2011 to September 2014, Detail Data has used the former 26 district council areas, which were still in operation then. The most deprived council area in Northern Ireland, Belfast City Council, secured 39.6% of Invest NI’s £323million funding for local business we have details on. Spend per head of population was £453. For comparison, Derry council area (the third most deprived and with the highest levels of unemployment in Northern Ireland) received considerably less support at 3.6%. Spend per head of population was £105. Invest NI’s Corporate Plan (2011-2015) also has targets in relation to Neighbourhood Renewal Areas (NRA) – which are the most deprived 10% of wards across Northern Ireland. However, according to Invest NI’s data the economic agency was struggling to meet some of those key targets by the end of September 2014. The targets included the creation of: 1,500 business start-ups by residents of NRAs and 280 business start-ups by young people Not in Education, Employment or Training (NEET). The data we received shows Invest NI funded 208 local start-ups in neighbourhood renewal areas by the end of September 2014 and 25 start-ups by NEETs through the NEET business start grant. Organisations working in the voluntary, community and social enterprises (VCSE) sector also received Invest NI funding. Extra Care for Elderly People (Antrim) provides home care services for the elderly, dependent adults and children (£126,000). Praxis Care (Belfast) provides services for adults and children with a learning disability, mental ill health, brain injury and for older people, including those with dementia (£70,024). Bryson Charitable Group (Belfast) provides social services, care services, energy advice, employment and training services, recycling services and inter-cultural services (£60,504). According to the data we received, Invest NI met its target for the number of new jobs in social enterprises, funding 409 through the Social Enterprise SFA (The Jobs Fund) and the Social Entrepreneurship Programme with a total investment of £952,000. However, the head of the Northern Ireland Council for Voluntary Action (NICVA) – an umbrella group for 1,100 community and voluntary groups which is involved in delivering the Detail Data project – described Invest NI’s overall support for the VCSE sector as “very small and piecemeal”. Seamus McAleavey said: “We are still in an area of rhetoric where everyone talks of the greater role for voluntary and community organisations, but I don’t see any strategy to make that an actual reality. Other voluntary, community and social enterprises also received Invest NI funding via other programmes including Gauge, part of the Now group. It secured £11,036 in August 2012 through the Growth Accelerator Programme (GAP). Now is a social enterprise that works in north and west Belfast to support people with barriers to learning and employment into jobs. Maeve Monaghan, Now chief executive, said: “There hasn’t been enough investment in the social enterprise sector. It has a big part to play in how we change Northern Ireland and the Northern Ireland economy. To view the full data from this investigation click here. The Detail is owned and operated by Below The Radar Ltd, a TV production company which has received funding from NI Screen. Fine Point Films, which owns Below The Radar, has also received funding from NI Screen and Invest NI. The companies employ 18 permanent staff. NI Screen, together with the two universities which also receive millions of pounds annually from the Department for Employment & Learning - were offered a total of £107million from Invest NI. • Detail Data is a joint project between investigative news website The Detail in Belfast and the Northern Ireland Council for Voluntary Action. The Detail is owned and operated by Below The Radar Ltd, a TV production company which has received funding from NI Screen. Fine Point Films, which owns Below The Radar, has also received funding from NI Screen and Invest NI. The companies employ 18 permanent staff.